Iconic bluewater boatbuilder Hallberg-Rassy’s latest model shows the company is not afraid to keep up with changing trends in boat design. 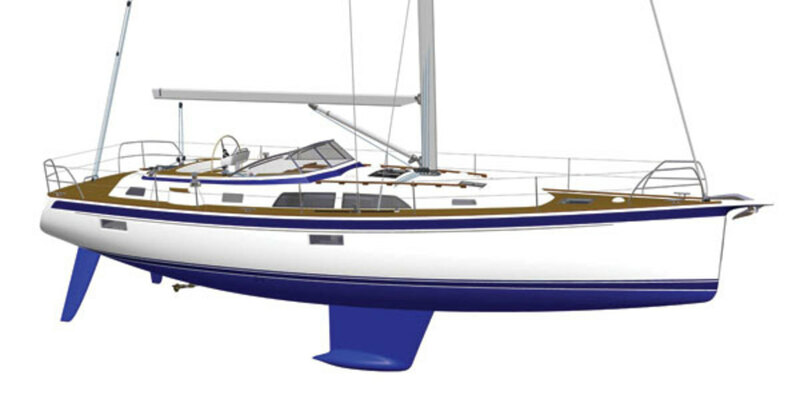 The Hallberg-Rassy 44 retains the virtues that have gained the boats such a dedicated following—excellent build quality, center cockpit, balanced hull form for good seakeeping, an interior layout that works just as well at sea as it does at anchor—and designer German Frers has introduced a number of new features. The most obvious of these is the twin-rudder configuration, a first for the Swedish builder. Also new is the molded bowsprit that holds the anchor and serves as a tack point for downwind sails. The jib furler is recessed under the deck, and all sail control lines run in galleries under the deck back to the cockpit. A self-tacking jib is optional. Although the 44 is only slightly longer on deck than the 43 Mk III it replaces, it is over 3ft longer on the waterline, which means a healthy boost in performance. The boat will be on display at Boot 2017 in Düsseldorf, Germany, next January. Is the age of the family-friendly foiling catamaran upon us? The folks at Stiletto Catamarans reckon it is. The Stiletto-Xf, a new iteration of the venerable 27ft Stiletto cat that was launched 40 years ago, is a collaboration with the designers at Schickler Tagliapietra, who have worked on America’s Cup and Volvo Ocean Race campaigns as well as with the Gunboat G4 foiling cat. The base model Stiletto-X will have conventional daggerboards, but it’s the lightweight carbon-fiber foiling Xf version that’ll get the headlines. Using the experience gained from the foiling Gunboat G4, the designers have tweaked the appendages to make this a user-friendly, well-mannered boat. At 30ft on the waterline, 18ft on the beam and displacing just 1,750lb unloaded, it can be broken down for trailering. Although accommodations are basic inside the Stiletto-X’s slim hulls, there’s plenty of room to crash out on the tramp under a boom tent in keeping with the spirit of the original Stiletto, which was widely used for family cruising. Built on the Outer Banks in North Carolina, the new Stiletto looks like a fun ride, and a half-dozen buyers have already handed over deposits. The builders also have plans to establish a foiling school—all in all, this boat could take off in every sense of the term.